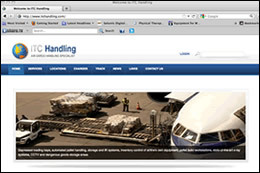 The IAM handling division, ITCHandling Ltd was established in 2005 to provide special air cargo handling facilities at Dublin, Shannon, Cork and Belfast airports for Agent customers and airline clients. All facilities are government approved and equipped with storage racking, lift systems, dock levellers and special areas for dangerous, radio active, valuable or temperature controlled goods. For added peace of mind, all sheds are fitted with the latest security surveillance equipment. ITC Handling Limited (ITCH) was established in 2005 to provide a dedicated Air Cargo Handling operation for client airlines, agents and trucking companies and to support the IAM air cargo sales and ITC trucking divisions. The ITC Handling operation provides Freight Agents with four state of the art warehouse facilities at Dublin, Shannon, Cork and Belfast airports. All facilities are equipped with dock levellers, powered pallet transfer systems, high level ULD storage, racking, lift systems and the latest security x-ray machines. Separate storage areas are available for high value, radioactive and dangerous goods. CLICK HERE to visit the ITC Handling website for more information.